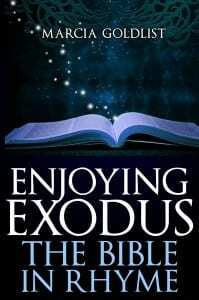 Enjoying Exodus: The Bible in Rhyme is the biblical book of Exodus written in rhyming couplets. The book of Exodus is a cornerstone of our shared heritage and one of the great works of civilization. Enjoy this story of promise and faith, of freedom and redemption, of revelation and covenant. This book takes you through the rise of Moses as a leader, the exodus of the children of Israel from Egypt, the parting of the Sea of Reeds, the Ten Commandments, the sin of the golden calf, and the building of the tabernacle. Now you can experience the book of Exodus in a new and enjoyable way – all in rhyme! Writing the Bible in rhyme is different from writing other books as the content is already written. However, I have to figure out how to write rhyming couplets that are easy to understand and true to the text. Self-publishing has opened up new doors for aspiring writers. Since you don’t have to find a publisher or an agent, publishing your own book can be a reality. So….get writing. But don’t forget to edit edit edit and edit again. I am the author of six books. Four in the Express Yourself in Rhyme series and two in The Bible in Rhyme series. I am very proud of my accomplishments. I have also started to speak on self-publishing to help others fulfill their dreams of publishing a book. I believe that my books Enjoying Genesis and Enjoying Exodus use my background in informal education and skill as a poet to help people read, understand and enjoy the best selling book of all times. I have already written the book of Genesis in rhyme (Enjoying Genesis: The Bible in Rhyme) and so this was a natural extension.